A collaboration with Ben Gwilliam. In this new work the post is used not to send recorded sounds but the objects to be used in their production. 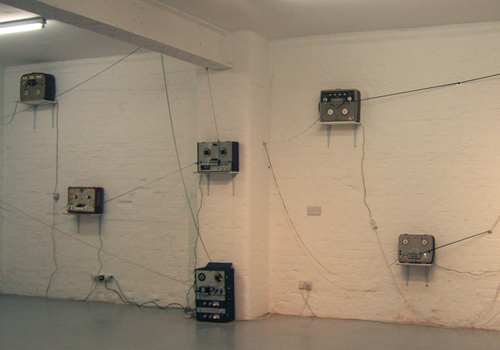 In the time leading up to the exhibition, each artist completely dismantled a tape machine of their own, right down to the components, wires and even collections of dust. Once the parts were listed they were methodically posted to the other collaborator in the two months preceding the show. Upon receiving a package of listed parts chosen specifically by the sender, the receiver then performs a single sound-producing action with each item in any way that they feel adequate. These actions were recorded to 1/4” tape.